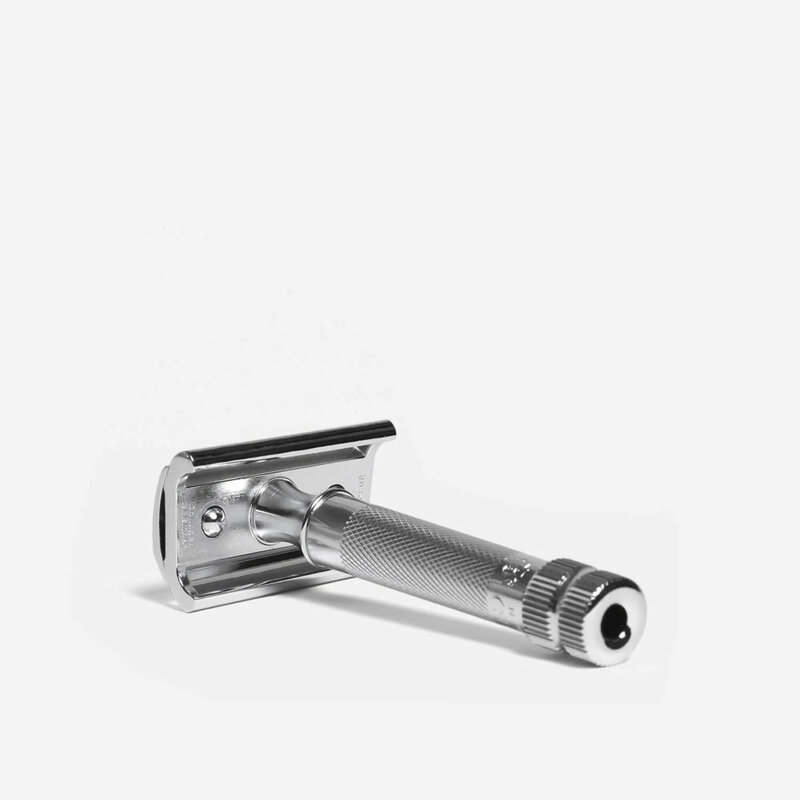 Slant head DE safety razor with a polished chrome finish. The Merkur 37C DE safety razor has a slant head which allows the blade to cut the hair at an angle, making the cutting process more efficient (much like how a guillotine cuts at an angle) and is therefore more suited to those with medium or heavy beard growth. 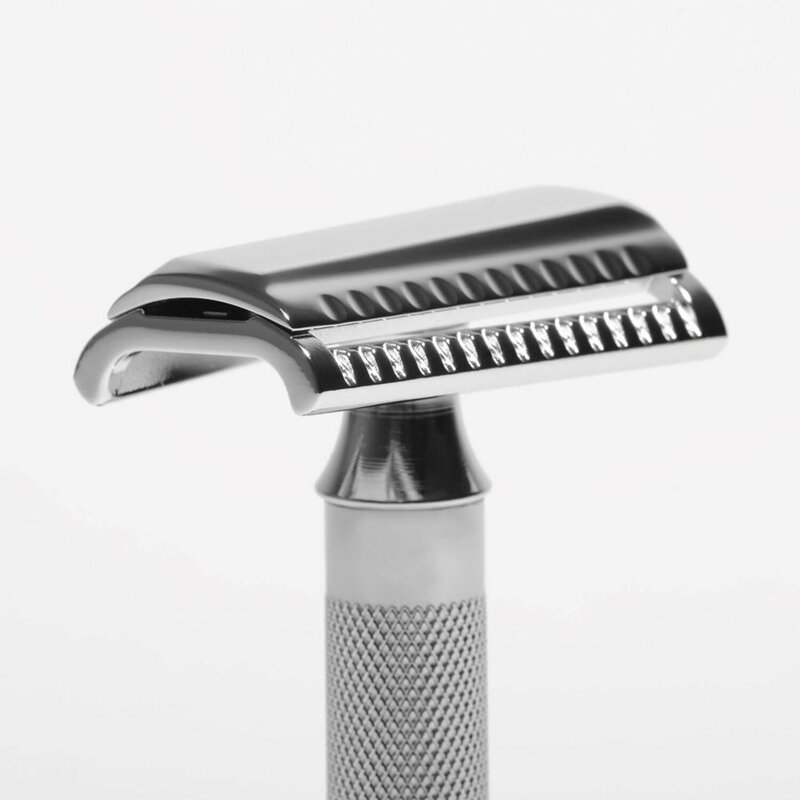 The razor is plated with polished chrome and features a 75mm knurled handle. I have had several razors in the 2 or 3 years since I started DE wet shaving and to be honest most where underwhelming. This razor is great! From first use it has given me a smooth, efficient shave with a mild feel on the face. Recommended. very good quality razor. gives a good clean shave. Merkur 37C Slant is my second DE razor. Coupled with Pol Silver razor blades, I’m having the best shaving experience ever. Ever since switching to wonderful world of wet shaving I never thought shaving could get any better, it did and it’s incredible. I never put any pressure and it cuts whiskers like they aren’t even there. That means of course no irritation, razor burns nor bumps. I’m so glad I’ve bought this. If you are looking for something different you should give this a try, you won’t be disappointed. The short version (after the longer one was lost in the aether). This razor has a reputation for easily and smoothly mowing down long growth. I’ve found this to be the case onthe cheek areas and, to a lesser extent, the neck. However, due to a lack of manoeuvreability, I’ve not found it to be an improvement elsewhere, and unforgiving. The edges have also been prone to tugging, which is painful! I had thought that Merkur quality had improved but it appears not. There are marks and specks in the plating and a couple of areas that I don’t believe are properly plated. The latter concerns me as it leaves the base metal vulnerable. I suspect that there are also alignment issues. Merkur has described the finish as ‘normal’ and does not appear to be interested in my concerns. There are enough reports of Merkur issues that I wouldn’t have confidence in anything other than a flawless example, I’m afraid. Disappointed but only surprised because I thought things had changed. Unless you particularly want a short heavy razor, there are better options for the money. incredibly close razor, demands attention and proper preparation. Not one for a quick shave but if you take the time it’s as good a shave as you’ll ever get without a cut-throat. The slant reached me in about a week- that’s fast!. Top notch service from Shave Lounge. The shaves with the slant was fantastic – it shaves like the 34C but I find it more effective for “problem” areas. BBS with fewer passes. Recommended both the slant and the store to my shaving friends. Brilliant as a razor, the chrome isn’t as good as Edwin Jaggers but not an issue for me. Delivered promptly. Excellent razor, middling aggression, perfect weight and balance with the stubby handle. The angled head makes the razor so very efficient. This could be my everyday razor. I started DE shaving more than a year ago and I have discovered that Merkur razors work very well for me. My favorite razor was the Merkur 34c. I also have experience with the Muhle R41 “2011” aggressive model which I use when I have more time. So I decided to try the Slant, or Slantbar, or Sledghhammer or 37c. What a great razor this is. Great weight and balance. Respect it without fearing it, and it is so rewarding. It provides a close shave that can be compared to the R41, but smooth at the same time resembling the 34c. Top service from Shave Lounge as well. This is one of my favourite razors and when used correctly will give you a very nice and easy shave, it has a reputation for being a hard razor to use, not so. This razor worked very well with a sharper blade, feather, iridium, etc. so don’t be put off buying one. Bought this after using a 34c for a couple of months wanting a more aggressive razor. Certainly a bit more aggressive than the 34c but haven’t found it deserves the reputation for being as feared as it has. Definitely less pull around the beard area than the 34c. Bought it, used it, love it. Nothing to fear. I bought this a few months ago after starting DE shaving with a Merkur 34C. I’ve got really thick facial hair and find the 37C really slices through my hairs in a way that feels a lot better than the 34C (usually same blades). Don’t be afraid of getting this because it’s not as dangerous or bad for beginners as people say. Personally, I found traditional shaving cream/soap to be extremely drying and not as slippery as non-foaming gels (like King of Shaves). So you should probably stick to whatever shaving medium you’re currently using so you don’t mistake the new razor for causing any irritation as I did. Been using the 37c for about a week now, and love it. This razor gives me the closest shave of any double edge I own. It can be an aggressive razor, but find I can enjoy a very smooth shave with no irritation if I prepare properly, and do not apply too much pressure. Not a razor that can be rushed, but not one that should be feared.